Klee's playful depiction of a solitary dog baying at a radiant moon exemplifies the artist's reliance on a linear style of representation. Using a series of sinuous lines, Klee creates a harmonious arrangement of three distinct forms: a dog, the moon, and in an unusual but charming visualization of sound, the dog's extended howl. Placed at the center of an amorphous ground of swirling colors, the dog's howl assumes a dominant pictorial role, winding, bending on itself, hanging in the night air like a wisp of smoke, while representing a visual as well as temporal record of the emanating sound. 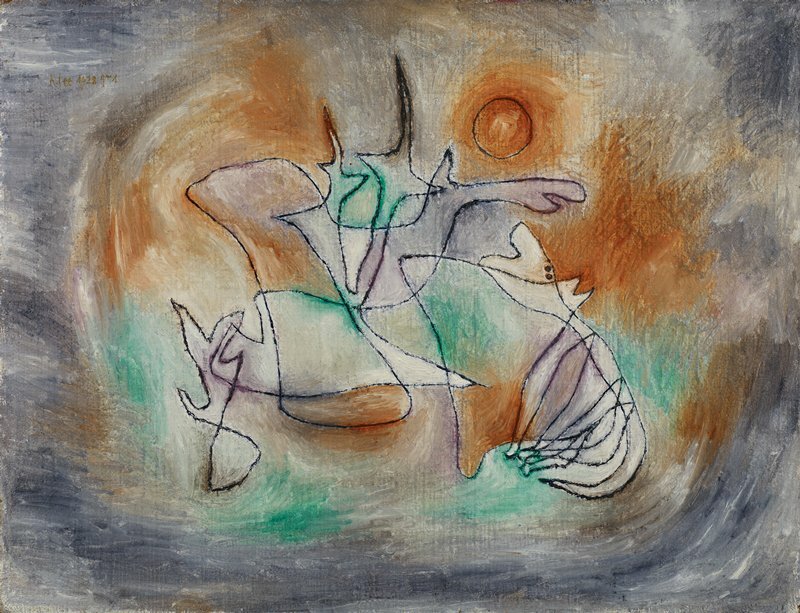 Klee's two-dimensional composition effectively supplants traditional spatial illusion, revealing a simple, yet elegant ideogram for the painting's whimsical subject.